Genuine Leather New Fanny Pack Waist Bag Hip Belt Pouch Travel Purse Men Women. 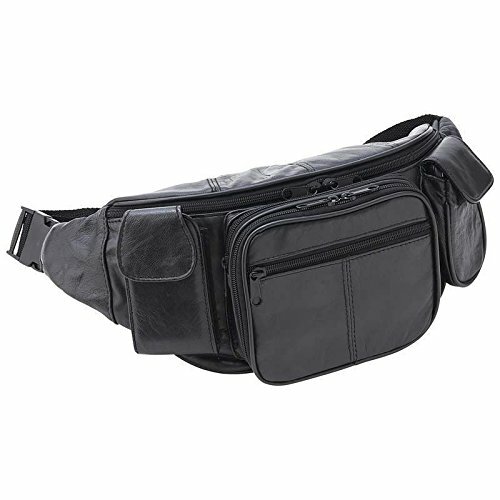 This is a genuine leather fanny pack for men and women. It's a perfect waist bag, pouch for travel or for shopping. It's brand new and features: Black genuine leather 1 main zippered compartment 2 small zippered pockets on both sides to keep coins or small items 1 front rectangle zippered pocket 1 back zippered packet Adjustable belt strap from 39" to 48". Measures: 12.5"x 5.75"x 4"
Adjustable belt strap from 39" to 48". Measures: 12.5"x 5.75"x 4"